On a cold day in Edinburgh, we nonetheless mustered a table-full of 2mm modellers: Alisdair, Alistair, Andy, Jim, Stephen, Chris, Phil, and Roy from the Grampian group met at Graham's house. After the customary tea, coffee, chat, soup, bacon rolls, and mince pies (thanks Roy), we proceeded to this month's demonstration. This was by Alisdair, who showed us how to (irreversibly!) modify commercial N gauge metal-tyred wagon wheels for use on 2mm finescale track. His chosen weapon was his 1970s-vintage Unimat lathe, still going strong and useful for all kinds of small modelling jobs. 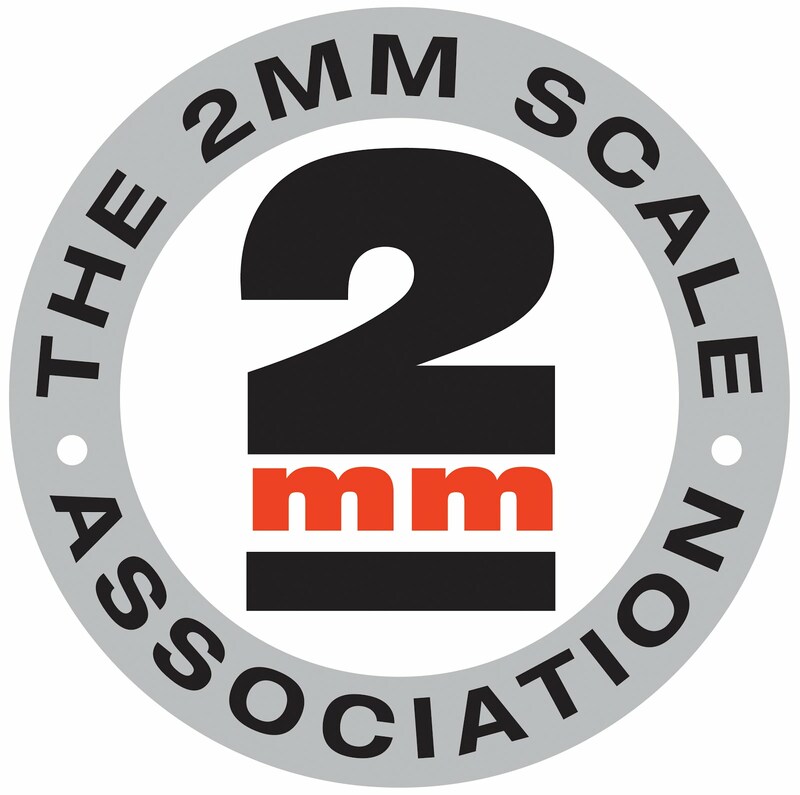 The 2mm finescale standards are given in the Association Yearbook and online. For convenience the relevant tables are reproduced here. The main dimension of interest is FW, the flange width. These tend to be around 0.5mm in modern N wheelsets, and although this is an improvement on the 0.7mm common on older wagons, it is still too wide to reliably go through the 2mm pointwork wing-rail flangeway (WF) and check-rail flangeway (CF) at 0.48mm and 0.53mm respectively. The 2mm standard for FW is 0.3mm. Cosmetically, it is also worthwhile reducing the tread width (TR) to 1.0mm, so that the wheel profile looks more prototypical. Alisdair explained he'd first tried modifying wheelsets when he first moved to 2mm scale from 4mm. He found an article in "Model Railways" which recommended using collets to hold wheels. It seemed to make sense, so he turned his own collets in the Unimat from brass and sawed slits so they could be compressed gently in a three-jaw chuck to hold the wheelset by the tyre of one wheel, without removing the wheels from the axle. The first one didn't work, because he had not tapered the inner diameter to suit the wheel tyre coning. The second one, with taper, worked once then also lost grip. Frustrated, Alisdair put the collets to one side and resigned himself to buying new wheelsets from the 2mmSA shop or sending N wheelsets off to the Association's wheel turning service. Which as we all know is very efficient and remarkably good value. But there was still a nagging wish for the satisfaction of doing the job himself. A chance conversation with 2mmSA magazine editor (and former FCAG regular) Anthony Yeates suggested a new direction: simply hold the wheelset lightly in the three-jaw chuck , and support the other end at the axle pinpoint in a length of brass tube in the tailstock chuck. The tube acts as a "hollow dead centre", holding the axle concentric and providing enough support for a tool to be used to turn down the wheel flange and face. Here's the tube in position in the tailstock chuck. To cut the metal, a boring tool was used, since it was small enough to fit between the two wheelsets on the axle. The aim is to do the work without removing the wheels from the axle, which risks destroying their concentricity. After setting and trueing the wheelset in the chuck with the axle in the tailstock support, the first operation is to thin the flange of the wheel in the 3-jaw chuck, then without disturbing the workpiece, thin the tyre of the other wheel. The chuck is then slackened off, the workpiece reversed and trued again, and the second flange and tyre are dealt with. Here's the operation in detail. First the wheelset is gripped in the three-jaw chuck, which is tightened to hold the wheel lightly. and its spindle advanced so the tube is positioned on the axle pinpoint so there is no slack, but without undue pressure. The chuck is spun once or twice by hand to check the whole thing is concentric, then tightened firmly using its tommy bars. It's important not to overtighten the chuck, or the wheel tyre will be dimpled and ruined. Don't forget to remove the tommy bars from the chuck! Here's the setup viewed from behind - headstock and 3-jaw chuck now on the right, tailstock on the left. We're going to remove metal from the green-line side of the flange first until dimension FW is 0.3mm, then from the green-line side of the tread until dimension TW is 1.3mm. The flange width is measured with a vernier gauge to determine its current width, 0.3mm is subtracted, and that's the amount of metal which needs to be removed. At this point a graduated handwheel on the tailstock is very useful, to give a fairly reliable indication of how far to go. and the flange is thinned with a multitude of light cuts, each time feeding the tool from the flange edge towards the axle, backing out, then advancing the tailstock slightly with its handwheel and taking the next cut. Once the dimension judged by the handwheel gradation is close, the lathe is stopped and the flange dimension checked with the vernier gauge. then the flange is brought to size with a final light cut or two. The lathe is stopped, and the wheelset reversed in the three-jaw chuck, and with the lathe under power, the squared-off edge of the first reduced flange is given a light touch from an nail file emery board (from a chemist or pound shop, or swiped from a dressing table) to round it off, to avoid it catching on point blades, risking derailment. (The photo shows the principle, but in practice the tailstock support would be engaged). Then the same set of operations is carried out again, to reduce the second flange and second tread and round off the second flange back. The comparison shows the difference in appearance between unmodified and reduced wheelsets. The wheels are now set to gauge and are ready for use in a wagon or coach. Disc locomotive wheels can be dealt with in the same manner, but spoked wheels generally can only have the flange reduced since the spokes will distort or shatter due to lack of support if an attempt is made to reduce the tread width. Alisdair also showed us his latest wheel manufacture efforts, having rejected those he showed us last month. The tyre is turned from steel. The brass insert is made by turning a disc and half axle as one piece, ensuring that the disc is a snug fit in the tyre. Spoke position are marked out using the lathe (switched off) as a dividing engine: the insert is held by its half axle in a chuck in the headstock, a tool is placed in the toolholder which is advanced to scratch a reference mark on the edge of the disk, the tool is backed off, then the headstock rotated by hand the correct number of degrees, and the position of the next spoke scratched on by advancing the tool. If there are no angular positions marked on the headstock, it is easy enough to add a paper disk or marker pen dots. Once the spoke positions are marked out, the spokes are cut and filed to shape. We did not find out whether the inserts are glued or soldered in place. Maybe Alisdair has not got that far yet! After this we had intended to do some further work on Sauchenford's fiddle yards. Alisdair was meant to have brought these with him from Glasgow, but unfortunately when he unpacked his car he found he'd left them behind. So there was nothing for it but to unpack individual projects and get on with that. Thanks Alisdair for an informative talk which demystified another 2mm "dark art". A fine sunny day for this month's meeting saw Alistair, Alisdair, Andy, Graham and Jim head well south of the Forth and Clyde valleys to Stephen's house in Lockerbie. The usual wide selection of magazines awaited (does anyone buy as many periodicals as Stephen?) and led to an extended chat session over tea and coffee which merged smoothly into lunch. Square sausage! prompting memories of the late Colin Brady's legendary fry-ups. There were two kinds of cake as well. This month's Short Talk was by Jim, who had whetted our interest in how he makes Alec Jackson couplings in 2mm scale by showing us some of his tools for the purpose at a meeting he hosted a few months back. AJs in 2mm scale were first written about, as far as I know, by Bert Groves in the May 1965 2mm SA magazine. Jim also used AJs since way back when, and first wrote up his techniques in the magazine in August and December 1994, with an important update in February 2007; and in MRJ (No 79, 1995, p153). However, he referred us to the standard work, the Scalefour Society's "Alex Jackson: the Man and the Coupling" (£6 to non-members), which explains their evolution and dimensions for different gauges, as well as their use in 2mm and Jim's development of the coil version. To couple, the two couplings slide over each other sideways; to uncouple, over a magnet beneath the track, the two couplings slide downwards and are forced sideways by the angled tail, until they pass beyond the opposing tail, before springing back on its other side when the train passes beyond the magnet. Steel wire, however, does not work in 2mm scale: the magnetic field passes through both couplings and draws both down, so that they stay in the same relationship to each other and do not uncouple. Jim therefore started making his couplings - pre-coil - from 0.006" (0.152mm, 38swg) hard-grade phosphor bronze wire, softened slightly by quickly flicking it through a match flame - not enough to heat it to red heat, which makes it completely soft, in which state it is useless. Without this slight annealing, there is a tendency for the wire to fracture when it is doubled back to form the hook. An early "conventional" AJ'd wagon using 6 thou PB wire was produced for inspection. In general, Jim works to half the 4mm dimensions, rounded up to the nearest quarter-millimetre. The couplings have a 1mm step introduced just in front of the headstock, so that the nose is 5mm above rail level. Setting the coupling at 5mm above rail level like this ensures the hook passes below the beam at buffer stops, rather than bounding off it. Coming back to the coil version of the coupling: the idea was to produce a highly flexible coupling in minimal space, by coiling up the 60mm length of spring wire which had proved insufficiently springy in the conventional version - there was a tendency not to couple up due to lack of sideways movement. Several experiments were tried to overcome this, including use of thinner wire and hinged couplings, but eventually the coil turned out best: so well, in fact, that the wire thickness could be increased to 0.008" (near enough 36 SWG, 0.193mm) which, handily, is available from Eileen's Emporium. This also had the major benefit of making the hook more robust. Making the coil is quite fiddly however, as Jim's demo showed. First a 60mm length of wire is cut off, and any burrs stoned off the end until it feels completely smooth. The wire is cut is straightened by placing the ball of a finger into the curve of the wire, then drawing the full length of the wire through finger and thumb applying gentle pressure from the thumbnail. After a few passes the wire is straight. The first job is to form the hook at the end of the coupling. This is simplified using a tool made from brass rod, with a 2.7mm-deep hole, able to take a single thickness of wire, drilled at one end to help form the first bend in the hook, and a 1.5mm hole, able to take a doubled thickness of wire, to help form the second. then the second bend is made and adjusted to 30° with fingers, judged by eyeball: note here that the pliers are only being used to hold the coupling, the angle is simply bent with gentle finger pressure. Be nice to your wire, Jim advised: treat it gently and bend it slowly to avoid fractures. The doubled-back part of the tail is strengthened by dipping it in solder paint and touching with a soldering iron. This avoids any roughness which might hinder the sliding action in coupling and uncoupling. A 1mm-deep step is then added at the correct distance. The first 90° bend is made with pliers, ensuring correct orientation with the hook; then a small steel rule which happens to be 1mm thick is used to help form the step. Next, the coil is wound around a length of 1.4mm steel drill rod. The rod has a handle of brass angle attached, with an adjustable clamp and small slots in whcih the hook of the coupling engages to produce a variety of coil-to-hook lengths. The rod is then held loosely in a pin chuck, so it can rotate; the chuck is clamped in a vice. Since the wire is a standard 60mm length, a shorter coupling will have a larger coil. The finished coil can now be gently eased off the rod. The lug has to be positioned fairly precisely as far back in the coil as possible, then the tail of the coupling is soldered to the longer side of the L, but without soldering the whole thing solid! This is done in a wooden jig with a slit cut to hold the coupling, with its position adjusted with tweezers. Once positioned, a craft knife is used to hold the wire while an iron is applied, helping avoid solder creeping towards the coil. Now, with the coupling held horizontally, all the angles are checked and corrected if necessary. Next, the coupling is mounted on the vehicle using superglue. (Jim uses cheap superglue tubes from pound stores, pricking the tube top then squeezing a little onto a metal plate. the excess is wiped off the tube and Vaseline applied to tube and top; the tubes are then stored upright and are cheap enough to throw away without regret when they harden). To glue the coupling in place, the wagon is strapped into a little jig, the coupling held in place, and a drop of glue flooded onto the wagon floor, without gluing up the coil. A drop of superglue is placed in the U, then the nail is placed on the coupling as close to the wheel axle as possible, set not quite vertical so a little sideways motion is imparted when a magnet attracts the dropper, to aid the uncoupling action. The nail is positioned with tweezers then held in place until the glue goes off. and on bogies, where the coil is placed below rather than above the coupling: the winding jig's L-clamp is used to adjust the coupling length. The nose should be offset towards the hook by a distance equivalent to the diameter of the wire - this causes a slight side pressure which helps prevent inadvertent uncoupling in a train in motion. One advantage of the coil design is that it makes the coupling very flexible in storage, with less change of damage or distortion which later causes problems in operation. This was demonstrated using a clear plastic box, so we could see how the coupling was simply pushed sideways without damage when pressed against the box wall, but returned to the normal position afterwards. Jim has completed more than 300 of these couplings. Practice makes perfect! To bring the story up to date, Jim gave a brief glimpse of the coupling R&D department - however, cameras had to be left at the lab door, so no pictures. That brought a fascinating demonstration to a close, and allowed a little more work to take place on Sauchenford's fiddle yard. Alisdair has also been working on scratchbuilt bogie (or pony truck?) wheels for his latest Highland loco. I can't remember if this was to be a 2-4-0 or a 4-4-0, but the wheels are made in his Unimat, with brass centres and steel tyres. The prototype diameter here was 2'6" I think. Jim showed us his 2mm scale signal wire posts - etched posts with pulley wheels from slices of copper wire - which he has written up recently on RMWeb. And so we came to the end of the meeting. Thanks very much Stephen for hosting and for the refreshments. Next month, we plan to meet in Edinburgh.